The cover for the book 'Bottled and Sold: The Story Behind Our Obsession with Bottled Water' is shown. With tap water safe and abundant in the U.S., Peter H. Gleick looks at why so many Americans drink their water from plastic bottles -- many of which end up in massive landfills. 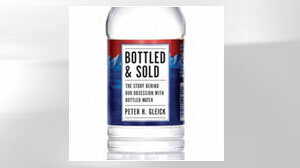 Gleick, recipient of a MacArthur fellowship and president of the Pacific Institute for Studies in Development, Environment and Security, argues for a new perspective on water management in his book, "Bottled and Sold The Story Behind Our Obsession with Bottled Water." Tap water is poison. —A flyer touting the stock of a Texas bottled water company. When we're done, tap water will be relegated to showers and washing dishes. —Susan Wellington, president of the Quaker Oats Company's United States beverage division. September 15, 2007, was a big day for the alumni, family, and fans of the University of Central Florida and the UCF Knights football team. After years of waiting and hoping, the University of Central Florida had finally built their own football stadium—the new Bright House Networks arena. Under clear skies, and with temperatures nearing 100 degrees, a sell-out crowd of 45,622 was on hand to watch the first-ever real UCF home game against the Texas Longhorns, a national powerhouse. "I never thought we'd see this, but we sure are proud to have a stadium on campus," said UCF alumnus and Knight fan Tim Ball as he and his family tailgated in the parking lot before the game. And in an exciting, three-hour back-and-forth contest, the UCF Knights almost pulled off an upset before losing in the final minutes 35 to 32. Knight supporters were thrilled and left thirsting for more— literally. Fans found out the hard way that their new $54-million stadium had been built without a single drinking water fountain. And for "security" reasons, no one could bring water into the stadium. The only water available for overheated fans was $3 bottled water from the concessionaires or water from the bathroom taps, and long before the end of the game, the concessionaires had run out of bottled water. Eighteen people were taken to local hospitals and sixty more were treated by campus medical personnel for heat-related illnesses. The 2004 Florida building code, in effect in 2005 when the UCF Board of Trustees approved the stadium design, mandated that stadiums and other public arenas have a water fountain for every 1,000 seats, or half that number if "bottled water dispensers" are available. 1 Under these requirements, the arena should have been built with at least twenty water fountains. Furthermore, a spokesman for the International Code Council in Washington, which developed Florida's building code, said, "Selling bottled water out of a concession stand is not what the code meant." The initial reaction from the University was swift and remarkably unapologetic: UCF spokesman Grant Heston appeared on the local TV news to argue that the codes in place when the stadium was designed didn't require fountains. A few days after the game, as news of the hospitalizations was reverberating, University President John Hitt said, "We will look at adding the water fountains, but I have to say to you I don't think that's the answer to this problem. We could have had 50 water fountains and still had a problem on Saturday." 2 Al Harms, UCF's vice president for strategic planning and the coordinator for the operations of the stadium, told the Orlando Sentinel, "We won't make a snap decision" about installing fountains in the new stadium. Harms did promise that they would triple the amount of bottled water available for sale, and give away one free bottle per person at the next game. 3 Harms also said, apparently without a trace of sarcasm, "It's our way of saying we're sorry." For some UCF students, this wasn't enough. One of them, Nathaniel Dorn, mobilized in twenty-first century fashion. He created a Facebook group, Knights for Free Water, which quickly attracted nearly 700 members. He and several other students showed up at a packed school hearing, talked to local TV and print media, and ridiculed the school's offer of a free bottle of water. Under this glare of attention the University did an abrupt about-face and announced that ten fountains would be installed by the next game and fifty would be installed permanently. All of a sudden public water fountains have vanished and bottled water is everywhere: in every convenience store, beverage cooler, and vending machine. In student backpacks, airplane beverage carts, and all of my hotel rooms. At every conference and meeting I go to. On restaurant menus and school lunch counters. In early 2007, as I waited for a meeting in Silicon Valley, I watched a steady stream of young employees pass by on their way to or from buildings on the Google campus. Nearly all were carrying two items: a laptop and a throw-away plastic bottle of water. When I entered the lobby and checked in at reception, I was told to help myself to something to drink from an open cooler containing fruit juices and rows of commercial bottled water. As I walked to my meeting, I passed cases of bottled water being unloaded near the cafeteria. Water fountains used to be everywhere, but they have slowly disappeared as public water is increasingly pushed out in favor of private control and profit. Water fountains have become an anachronism, or even a liability, a symbol of the days when homes didn't have taps and bottled water wasn't available from every convenience store and corner concession stand. In our health-conscious society, we're afraid that public fountains, and our tap water in general, are sources of contamination and contagion. It used to be the exact opposite—in the 1800s, when our cities lacked widespread access to safe water, there were major movements to build free public water fountains throughout America and Europe. In London in the mid-1800s, water was beginning to be piped directly into the homes of the city's wealthier inhabitants. The poor, however, relied on private water vendors and neighborhood wells that were often broken or tainted by contamination and disease, like the famous Broad Street pump that spread cholera throughout its neighborhood. At the time of London's Great Exhibition in 1851, conceived to showcase the triumphs of British technology, science, and innovation, Punch Magazine wrote: "Whoever can produce in London a glass of water fit to drink will contribute the best and most universally useful article in the whole exhibition." 4 Just three years after the Exhibition, thousands of Londoners would die in the third massive cholera outbreak to hit the city since 1800. By the middle of the twentieth century, spectacular efforts to improve water-quality treatment and major investments in modern drinking-water systems had almost completely eliminated the risks of unsafe water. Those of us who have the good fortune to live in the industrialized world now take safe drinking water entirely for granted. We turn on a faucet and out comes safe, often free fresh water. Notwithstanding the UCF stadium fiasco, we're rarely more than a few feet from potable water no matter where we are. But those efforts and investments are in danger of being wasted, and the public benefit of safe tap water lost, in favor of private gain in the form of little plastic water bottles. The growth of the bottled water industry is a story about twenty-first century controversies and contradictions: poverty versus glitterati; perception versus reality; private gain versus public loss. Today people visit luxury water "bars" stocked with bottles of water shipped in from every corner of the world. Water "sommeliers" at fancy restaurants push premium bottled water to satisfy demand and boost profits. Airport travelers have no choice but to buy bottled water at exorbitant prices because their own personal water is considered a security risk. Celebrities tout their current favorite brands of bottled water to fans. People with too much money and too little sense pay $50 or more for plain water in a fancy glass bottle covered in fake gems, or for "premium" water supposedly bottled in some exotic place or treated with some magical process. In its modern form, bottled water is a new phenomenon, growing from a niche mineral-water product with a few wealthy customers to a global commodity found almost everywhere. The recent expansion of bottled water sales has been extraordinary. In the late 1970s, around 350 million gallons of bottled water were sold in the United States—almost entirely sparkling mineral water and large bottles to supply office water coolers—or little more than a gallon and a half per person per year. As the figure below shows, between 1976 and 2008, sales of bottled water in the United States doubled, doubled again, doubled again, and then doubled again. In 2008, nearly 9 billion gallons (over 34 billion liters) of bottled water were packaged and sold in the United States and five times this amount was sold around the world, feeding a global business of water providers, bottlers, truckers, and retailers at a cost to consumers of over a hundred billion dollars. Americans now drink more bottled water than milk or beer—in fact, the average American is now drinking around 30 gallons, or 115 liters, of bottled water each year, most of it from single-serving plastic containers. Bottled water has become so ubiquitous that it's hard to remember that it hasn't always been here. As I write this sentence I'm sitting in the café in the basement of the capitol building in Sacramento, California, and all I have to do is lift my eyes from my computer screen—right in front of me are vending machines selling both Dasani and Aquafina. Yet, like UCF football fans, I can't tell you where the nearest water fountain is. Millions of Americans still drink tap water at home and in restaurants. But there is a war on for the hearts, minds, and pocketbooks of tap water drinkers, a huge market that water bottlers cannot afford to ignore. The war on the tap is an undeclared war, for the most part, but in recent years, more and more subtle (and not so subtle) campaigns that play up the supposed health risks of tap water, or the supposed health advantages of bottled water, have been launched by private water bottlers. How do you convince consumers to buy something that is essentially the same as a far cheaper and more easily accessible alternative? You promote perceived advantages of your product, and you emphasize the flaws in your competitor's product. For water bottlers this means selling safety, style, and convenience, and playing on consumer's fears. Fear is an effective tool. Especially fear of sickness and of invisible contamination. If we can be made to fear our tap water, the market for bottled water skyrockets. I guess I shouldn't have been surprised, therefore, when I opened my mailbox and found a flyer with a cover image of a goldfish swimming in a glass of drinking water. "There is something in this glass you do not want to drink. And it's not the fish," shouted the bold and colorful text in the mailer, offering me home delivery of bottles of Calistoga Mountain Spring Water. "How can you be sure your water is safe? Take a closer look at the water in our glass. Can you tell if it's pure? Unfortunately, you can't." And the solution offered? The "Path to Purity" lies with bottles of water, delivered to your door by truck, under a monthly contract. Subtler advertising approaches also play on our fears. PepsiCo hired actress Lisa Kudrow to promote Aquafina with the phrase "So pure, we promise nothing" in a campaign Brandweek magazine jokingly called the "Nothing" campaign. 9 Kinley in India offers "Trust in every drop," while another Indian bottler, Bisleri, advertises "Bisleri. Play safe." The industry continues to push this argument. In August 2007, they bought full-page ads in the New York Times and other papers. "Whether it comes from a faucet or a bottle, drinking water is an easy step people can take to lead a healthier lifestyle. So, as far as we're concerned, the drink in everyone's purse, backpack, and lunch box should be water." In December 2007, in testimony to the U.S. Congress, the IBWA President, Joe Doss, said, "Consumers also choose bottled water over other beverages because it does not contain calories, caffeine, sugar, artificial flavors or colors, alcohol and other ingredients. "26 Bottled water consumption is good, the industry argues, because the growth of bottled water sales has come not at the expense of tap water, but of other beverages. This is an intriguing and potentially powerful argument, except that it is false. After hearing the industry repeat this claim over and over, I went and looked up the actual numbers. Are we really drinking bottled water instead of soft drinks and other consumer beverages, as the industry argues, or are we actually drinking less tap water? The U.S. Department of Commerce collects and publishes excellent data on beverage consumption. Contrary to what the bottled water industry argues, the numbers show that we are buying more bottled water and carbonated soft drinks, and drinking less of everything else, including milk, coffee, tea, fruit juices, beer, wine, hard alcohol, and especially tap water. Statistics clearly show the growth in consumption of both soft drinks and bottled water at the expense of everything else we drink. Indeed, between 1980 and 2006, data on beverage consumption reveals that on average, each of us is actually drinking around 36 gallons per year less tap water now. With what have we replaced this water? Soda and bottled water. Over this same period of time, our consumption of carbonated soft drinks has grown by 17 gallons per person per year, our consumption of bottled water has grown by 25 gallons per person per year, and our purchases of all other beverages, including milk, juices, beer, tea, coffee, and hard liquor have dropped by 6 gallons per year. The beverage companies are winning the war on tap water. As long as people can be made to fear tap water, they will seek out alternatives they think offer more safety. But we have to ask: is bottled water actually any safer? What do we know about what's actually in our tap water—or in the bottles of water we buy? And how safe is it to drink? Endnotes, Chapter 1 1. See UCF press release of July 11, 2005, by Tom Evelyn (http://www.wesh .com/news/14143574/detail.html?rss=orl&psp=news), stating that the Board "has not yet formally voted on whether to build the stadium." Similarly, in a March 31, 2005, presentation to the UCF Board of Trustees by the stadium architects 360 Architecture, all permitting for the stadium was to be complete no earlier than July 2005, well after implementation of the 2004 building codes. "Code group: University of Central Florida didn't adhere to drinking water rules," Orlando Sentinel, September 22, 2007 (from http://www.water webster.com/BottledWater.htm, accessed August 10, 2008). See also Table 403.1 of the 2004 Florida Building Code, which states that stadiums (A-5 category buildings) must have one water fountain per 1000 occupants. The requirement seems to be the same in the 2001 Florida Plumbing Code, Table 403.1, chap. 4, p.4.1 (see http://www2.iccsafe.org/states/Florida2001/FL _Plumbing/FL_Plumbing.htm). 2. UCF To Install Water Fountains in New Stadium (video), http://www.youtube .com/watch?v=4t-44S_gebI&feature=related (accessed September 18, 2007). 3. Luis Zaragoza and Claudia Zequeira, "UCF in hot water with fans: Stadium has no drinking fountains; students thirsty for answers," Orlando Sentinel, September 18, 2007. 5. See http://borregospringsbottledwater.com/waterfaq.php (accessed September 12, 2008). 6. Dave Carpenter, "Thirsty for utter dominance, Gatorade declares war on tap water," Denver Post, May 28, 2000. 7. See http://www.time.com/time/magazine/article/0,9171,91374,00.html (accessed September 19, 2008). 8. Brendan Buhler, "Convention Crashing: The International Bottled Water Association," Las Vegas Sun, October 9, 2006. 9. Brandweek, "Aquafina Employs Kudrow to Tout 'Nothing' Campaign," July 2, 2001, http://findarticles.com/p/articles/mi_m0BDW/is_27_42/ai_76443142 (accessed December 10, 2009). 10. International Bottled Water Association New Release, "ABC News 20/20 is Wrong About Bottled Water," May 7, 2005. 11. Quoted in Jonathan Fowler, "Study: Bottled Water Not Better," Associated Press, May 2, 2001. 12. See http://www.fda.gov/FDAC/features/2002/402_h2o.html (accessed September 12, 2008). 13. Australasian Bottled Water Association website, http://www.bottledwater.org .au/scripts/cgiip.exe/WService=ASP0003/ccms.r?PageId=5002 (accessed December 10, 2009). 14. On its website (www.cei.org/about) the CEI describes itself as "a public interest group dedicated to free enterprise and limited government," accessed December 10, 2009. 15. Fred Smith, e-mail to author, October 21, 2007. 16. See http://enjoybottledwater.org/?p=85 (accessed September 15, 2009). 17. Jody Clarke (CEI), e-mail to author, September 17, 2008. 18. The Coca-Cola Company, "The Olive Gardens targets tap water, and wins!" from http://cockeyed.com/coke/html/olivegard_article_ss2.html (downloaded August 21, 2001). See also David Gallagher, "Having customers say no to tap water," New York Times, August 21, 2001. 19. See http://www.stayfreemagazine.org/public/coke_story.html (accessed September 10, 2008). Quotation from metafilter.com, http://www.metafilter.com/ 9399/ (accessed December 10, 2009). 20. See http://findarticles.com/p/articles/mi_m0BQE/is_4_17/ai_n16374556/print (accessed September 10, 2008). 21. See, for example, Brita's full-page ad in New York magazine on January 16, 1995, entitled "We'd like to clear up a few things about tap water" (22), or the Brita ad in the October 2003 issue of Ebony magazine describing their water pitcher that "turns tap water into drinking water" (146). 22. "Canadian Advertising Success Stories 2007: Brita," http://www.cassies.ca/winners/2007Winners/winners_brita.html (accessed December 10, 2009). 23. Advertising Standards Canada, "Ad Complaint Reports—Q3 2006," http://www.adstandards.com/en/Standards/adComplaintsReports.asp?periodquarter=3&periodyear=2006 (accessed December 10, 2009). 24. Brian Howard, "Despite the hype, bottled water is neither cleaner nor greener than tap water," E—The Environmental Magazine, December 9, 2003, http://www.commondreams.org/headlines03/1209-10.htm (accessed December 10, 2009). 25. Gregory Karp, "The Morning Call: Tap water might fit your bill better than bottled," Chicago Tribune, September 10, 2006. Also, see Kay's quote at http://a.abcnews.com/WNT/Story?id=131639&page=2 (accessed March 16, 2009). 26. Written Testimony of Joseph K. Doss, President and CEO, International Bottled Water Association Before the Domestic Policy Subcommittee of the Oversight and Government Reform Committee of the United States House of Representatives. Hearing on "Assessing the Environmental Risks of the Water Bottling Industry's Extraction of Groundwater," Washington, D.C., December 12, 2007.